Discussion in 'Politics, Religion, Social Issues' started by jnpy!$4g3cwk, Aug 26, 2012. Let's see now, what happened in 1980? Anybody want to defend "trickle down" again?? What happened in 1970 should be the question when looking at that chart. We all got a lot poorer due to the failed economic policies of the 60s and 70s. Only in the sense that the economy began to stagnate, leaving the political door open to con men pitching dishonest economic theories. "It would be interesting to see what this chart looks like when you include benefits and government transfer payments into the mix. Another interesting chart would be employer's cost of employing these workers." "The average American house size has more than doubled since the 1950s" (and families are smaller now than they were then)." "Since this chart measures average family income, we need to understand dynamic changes in family size over the period. In fact, family sizes shrank since the 1980s. Adjusted for family size, do we get the same picture? In other words, on a per capita basis, how does the data look?" yes we would as this is based on percentile. Stop trying to cover up GOP lies and BS. You forgot the "failed economic policies of the 50s"
You might notice that, even though growth was low in the 70s, the other groups still did better than the top 5%, but, every income quintile/group grew, even the top 5%. The rich were better off than before; it is just that the other groups continued to catch up. Luckily, Reagan came along to restore the super-rich to their rightful place. But, I'm glad that you brought up the 70s anyway. Two things happened in the 70s that slowed growth down: the 1973 oil shock (Republican president) and the 1979 oil shock (Democratic president). In case you forgot. There are various measures of income inequality and they all point to the same picture: The distribution of income in the US has become more polarized since the 1970's, with the wealthy gaining much more than the middle, working and poor classes. Don't forget that these types of graphs typically depict yearly growth or shrinkage of income, and thus the effects accumulate over time - indeed across generations. I expect folks in the US will wake up soon and realize the American dream is fading for everybody except the rich. The question is whether the necessary changes can be achieved politically to restore it. I'd love for us to return to the economics of the 50s. Too bad the Republicans aren't offering that but instead, a return to 1950s social policy. To me the 70's thing is not what gets my attention. I did look up what happened in the 1970's and it was the oil crises and the end of the Vietnam war. Those things are going to do a number. But what is a problem is how quickly the richer are getting richer and the poorer are falling more and more behind. The top 5% growth should not be growing faster than everyone else and the bottom 20%. It just makes the problem worse. The middle class in the US is being destroyed. Most of them are being pushed down the the poorer side of it. We are quickly going back to the elites and surfs. That is not good. The 80's was a transition from paper to the internet. That's why you see the 90's so high. That was when the big internet millionaire bubble started to grow. 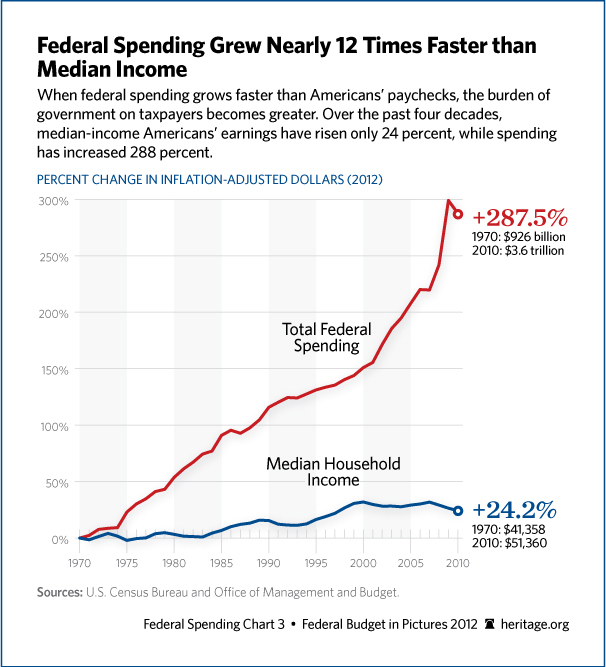 The graph that is the subject of this thread is in reference to median income and has nothing to do with government spending. If any substantial portion of that government spending had to do with higher wages it would show an increase of the median income. ...... We are quickly going back to the elites and surfs. That is not good. Agreed; but that's what happens when the government takes care of you ..... . Sorry; I thought the thread subject was "'60 Years of American Economic History Told in 1 Graph" . And it starting taking off under the GOP and kept making worse in large party by the GOP. Wow and why do you support the GOP now? It does say that. But if you look at the graph it shows median income. It does not show spending. Wow; did I once mention party ---- I thought I was pretty careful to say GOVERNMENT . My economic history story, told in one graph (if you look at it), shows both ! well just dig threw your other post. It clear you are supporter of the GOP and for all this long list of reasons but then you post stuff like that graph that shows that the GOP has historicly gone against what you are so called saying they are good for. So again why do you support the GOP when even your own so called evidance says other wise. I'm happy for you but this thread is about a graph that shows income not spending. ......So again why do you support the GOP when even your own so called evidance says other wise. Blah, blah, blah ..... I support whoever will give us smaller government and/or pass a budget. I've voted for both parties, and been disappointed by both . Currently I'll probably vote for "Hope and Change" ......again. .... and I'm happy for you too; maybe there's a slight chance individual income goes down relatively when government spending goes up . It is true that conservatives spend their time changing their minds. Look at Mitt Romney . But aside from Mitt I don't think they are any better than liberals. Agreed; every time I consider changing my mind someone here convinces me not to . Actually I found the ENTIRE Pew Research report very interesting; much more so than the "Atlantic" blurb. Lots of other things to change my mind about . If you believe that then I would suggest taking an economics class. Who could be offended by someone called Peace .